So. We are going to Nevada, finally! But we are going in less than one month, and I have no itenerary planned! Help! A trip through the Everglades, Florida. Take a boat ride through the Everglades and encounter more than ‘gators! This weekend, I made brunch for the first time. As ever, I made way too much, but what I made was incredibly good. Plus, it’s quick and easy to make. Brunch will become a more regular theme now in our home! I love pancakes, our Belgian pancakes, where you can find my recipe here: Recipe: pancakes! But yesterday, I tried the American style pancakes: the big and fluffy ones. It’s so easy to make! This recipe is with blueberries, but you can make them with any type of fruit you want to add! Or nothing and smother them in maple syrup. Next week, I’m off to my second home, Florida. You would think I’ve seen the place more than enough, right? Well, I can’t get enough and luckily for me, my husband loves the place too! We’re going to the Gulf Coast this time, I’m looking forward to bringing lots of new tips home for you as well as some lovely pictures. Got any tips for me along the way? Do share them!! Before going on our latest trip to NYC, I got this pretty amazing tip for a restaurant from the owner of the Bentley’s in Ostend. Remember the review I wrote about his restaurant? 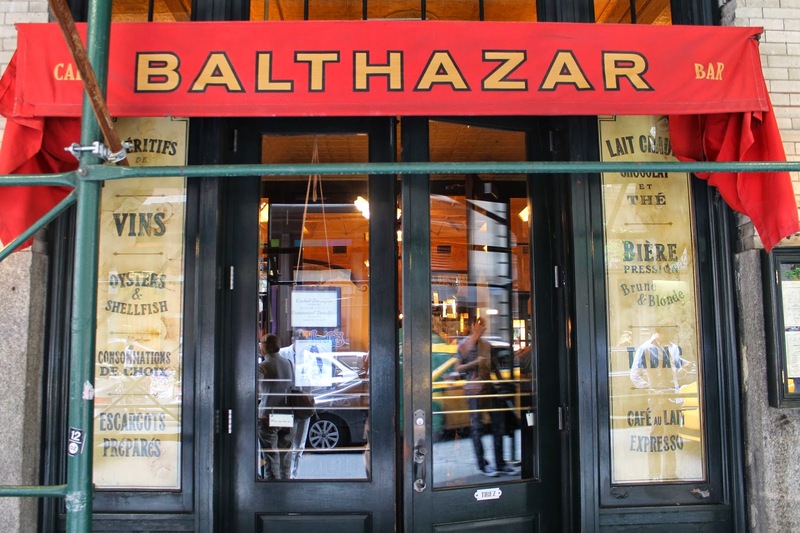 Bentley’s Ostend review Jean-Philippe made me promise to stop by the Balthazar restaurant in Soho. Since it was only a block or two from the Soho Grand, it was an easy promise to make. He was pretty lyrical about the place, telling me it was one of his favorite restaurants of the city, it’s décor so similar to a French bistro. On our last day, we decided to go there and have breakfast before heading off to the airport.